Used for precise bore measurements, these gages are the perfect instruments for fast easy sets and gauging. Why a dial bore gage? A dial bore gage is one of the most accurate tools for measuring a cylindrical bore, or for checking a bore for out-of-roundness or taper. The dial bore gage does not give a direct measurement; it gives the amount of deviation from a preset size, or the amount of deviation from one part of the bore to another. A master ring gage, an outside micrometer, or a caliper can be used to preset the gage. A dial bore gage has two stationary spring-loaded points and an adjustable point to permit a variation in range. These three points are evenly spaced to allow accurate centering of the tool in the bore. A fourth point, the tip of the dial indicator, is located between the two stationary points. By simply rocking the tool in the bore, the amount of variation on the dial can be observed. Standard accuracy is five ten thousandth (0.0005) of an inch however accuracy can be improved to .0001” by using a Chicago Brand # 50156 indicator and 50158 indicator extension kit. Because of limited gage travel, each gage is supplied with interchangeable anvils and spacer(s) to configure the gage for a specific range of measurement. 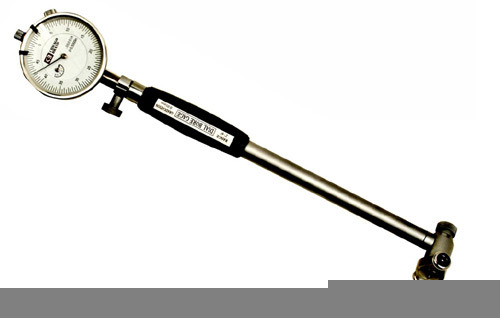 Each Chicago Brand Dial Bore Gage is supplied with a chart that defines the appropriate anvil and spacer to measure bores within the overall range of the gage.